Grade 430 is a ferritic, straight chromium, non-hardenable grade, combining good corrosion resistance and formability characteristics with useful mechanical properties. Its ability to resist nitric acid attack permits its use in specific chemical applications but automotive trim, indoor panelling such as refrigeration cabinets and appliance components are its largest fields of application. This grade is only readily available in sheet and coil (up to 1.2mm thick), most commonly in BA or 2B finishes, or polished to No4. The BA finish sheet has a quite bright, reflective appearance. Grade 430F is the free-machining version of this grade, produced in bar form for high speed machining in automatic screw machines. Grade 430 has good resistance to a wide variety of corrosive media including nitric acid and some organic acids. It attains its maximum corrosion resistance when in the highly polished or buffed condition. Its resistance to pitting and crevice corrosion resistance is a little lower than that of Grade 304. It is not usually recommended for Grade 430 to be subjected to exterior exposure, but it performs well in mild indoor environments. Stress corrosion cracking resistance of Grade 430 is very high, as it is for all ferritic grades. Heat to 815-845°C, hold for ½ hour per 25mm of thickness, slow furnace cool to 600°C and then quickly air cool. Slow cooling from 540-400°C will cause embrittlement. Heat to 760-815°C and then air cool or water quench. This grade is not hardenable by thermal treatment. Note that 430 is likely to scale more heavily at elevated temperatures than 304, and the scale produced is more difficult to remove by pickling. If welding is necessary pre-heat at 150-200°C. Embrittlement in the weld metal and heat affected zone can be reduced by a post-weld anneal at 790-815°C, but grain refinement will not occur. Use Grade 430, 308L, 309 or 310 filler rod, depending upon application. AS 1554.6 pre-qualifies welding of Grade 430 with Grade 309 filler rods and electrodes. Grade 430 is easier to machine than the standard austenitic grades such as 304, but there is still a tendency for galling and pick-up on the cutting tool. Bars that have been lightly drawn are easier to machine than those in the annealed condition, but Grade 430 is not usually available in bar. Grade 430F, the free machining version of 430, is very much easier to machine. The lower work hardening rate makes bending and forming somewhat easier than for grade 304, but the lower ductility restricts very severe operations. Wherever possible severe bends should be made with the bend axis at right angles to the rolling direction. Severe cold heading of 430 wire is possible. 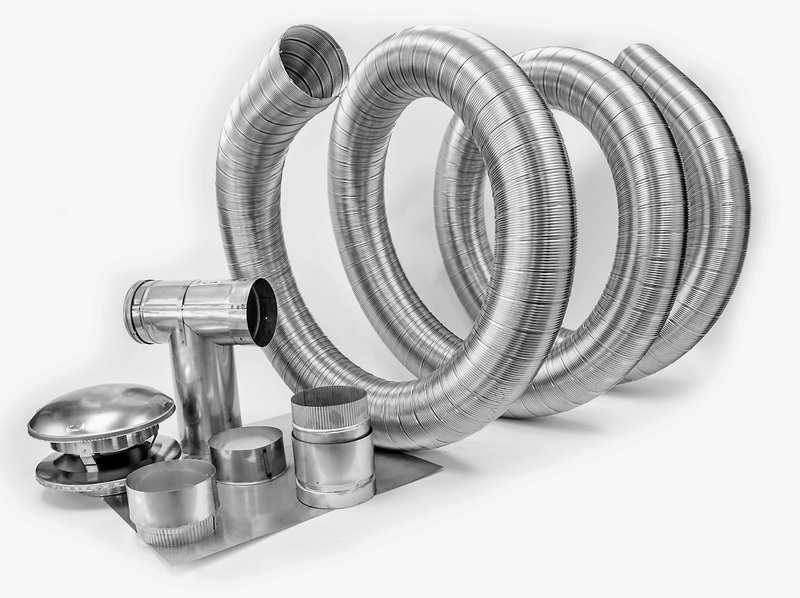 If very severe cold working is required it may be necessary to carry out a sub-critical intermediate anneal. Linings for dish washers and panels in other domestic appliances. Refrigerator cabinet panels. Automotive trim. Lashing wire. Element supports. Stove trim rings. Fasteners. Chimney liners. These properties for 430 are specified for flat rolled product (plate, sheet and coil) in ASTM A240/A240M. 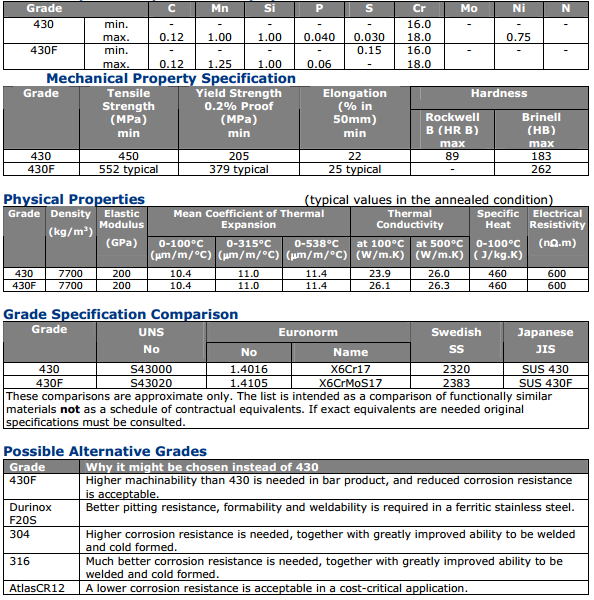 Properties of Grade 430F are specified for bar in ASTM A582. Similar but not necessarily identical properties are specified for other products in their respective specifications.